Big Boy Bed, take two. 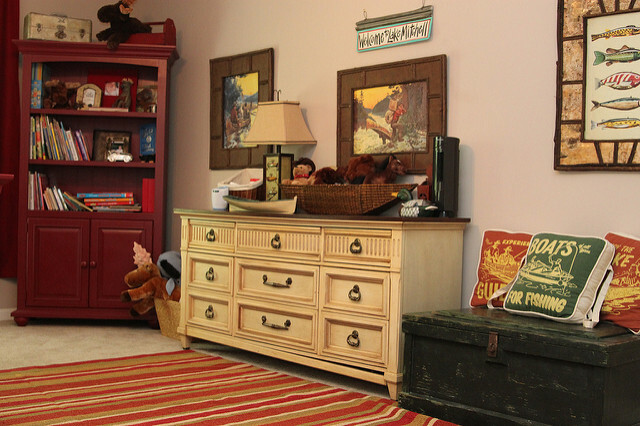 Garrett’s Great North Woods nursery theme is still going strong after three years! Since we moved into the new house his space has grown, so the decor keeps growing, too. I’m really happy I chose this rustic theme since we had so much vintage decor at the old lake cabin, as well. After we sold the cabin all the decor items got packed up and stored in the basement. Finally I sorted through it all and picked out a few new items to incorporate into Garrett’s bedroom. I added a new Tommy Hilfiger quilt that I scored at TJ Maxx for about $20.00! Does it match the theme? Not really, if you look closely. Does it match the color scheme and brighten up all that red? Yes. Sold. Oh, and I almost forgot to mention the moose and bear Pillow Pets that Nana bought him for Christmas. The end table got a monster and ghost repellent kit. And no, I’m not even joking. Inside is a barking Slinky Dog flashlight, a toy drill that shoots a red laser beam across the room and makes a grinding sound, and “monster repellent” which is actually just Watkins lemon scented air freshener. All of that extra protection and he STILL won’t sleep in this room all night long. I am beginning to wonder if he will still be sleeping at the foot of our bed when he is 25. I love that kid but man, I hope not. 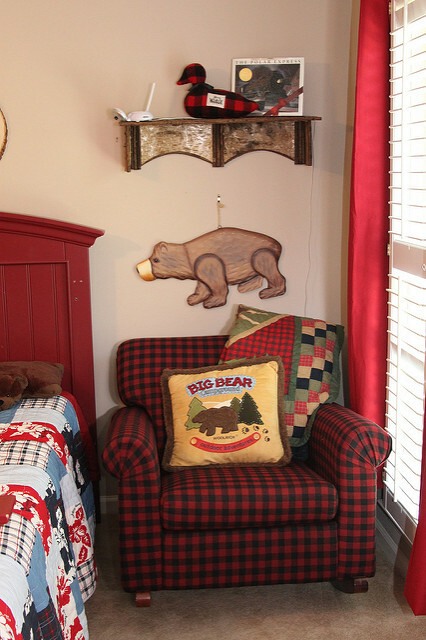 We moved the rocking chair from the playroom back into his bedroom since the buffalo check matches a lot better in this room. Between the windows hangs this wooden shelf with his “My first tooth” and “My first curl” Limoges type boxes that I got as a gift from my best friend.Love these guys. His first curl is indeed inside the octopus. Still waiting on his first tooth to pop out, but you better believe it will be going inside that gator when it does. The bookcase has a lot more books on it. I probably should organize those, but they just get knocked right back over again whenever I do so they will stay that way. On top of the bookcase is an old (OLD! )tacklebox that belonged to J’s Granddad. I bought the red toolbox at a little antiques place outside of Montevallo. 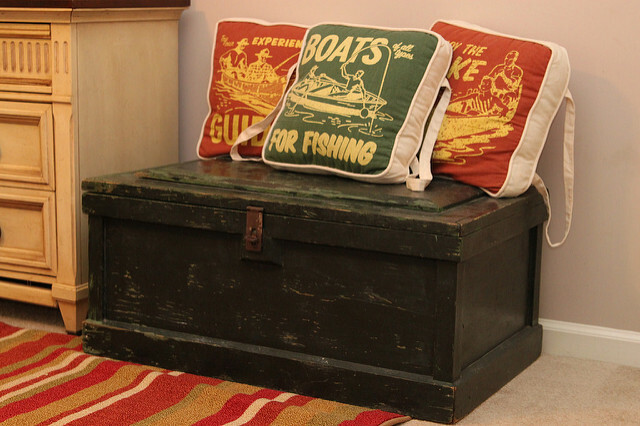 We moved the old green chest out into the room so you can see it better. I like it better by the door than tucked away in the corner. Five years later and I’m still in love with these pillows made by Seasons of Cannon Falls. I love his growth chart. It came from Target when they had all the Woolrich stuff in stock. Glad I snagged it when I did because it’s no longer being carried. I found this cute sign at Homegoods one day and loved how the red matched the other stuff in his room. 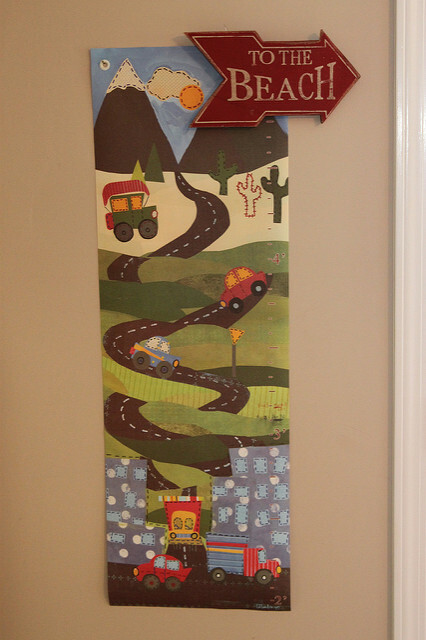 Plus it helps point the way to the beach in the playroom! Feel free to take the grand tour of the playroom if you haven’t already seen it! very cute and your photos are outstanding! That is the cutest boys room! I love all the vintage touches and the details you used while decorating! so very sweet…I love the ghost repellent kit 🙂 …AND the $20 score on the blanket! ADORABLE…. YOU ARE SOOOOOOOO GOOD!! Super cute, as always! Love the ghost repellent kit. PS: I want a laundry chute. What an adorable room! I love those pillows on the chest, too! This is so absolutely adorable…this is exactly what I was going for with my son’s room…I say “going for” because it didn’t turn out near as cute as yours!!! 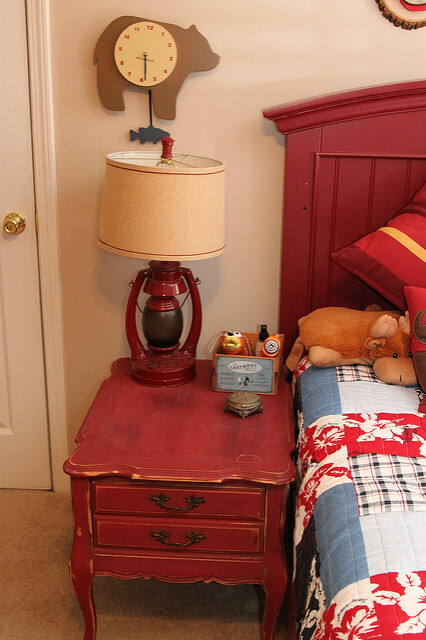 LOVE that bedside lamp…especially next to the monster repellant (c: So glad you linked up so I could find you! i am in love! 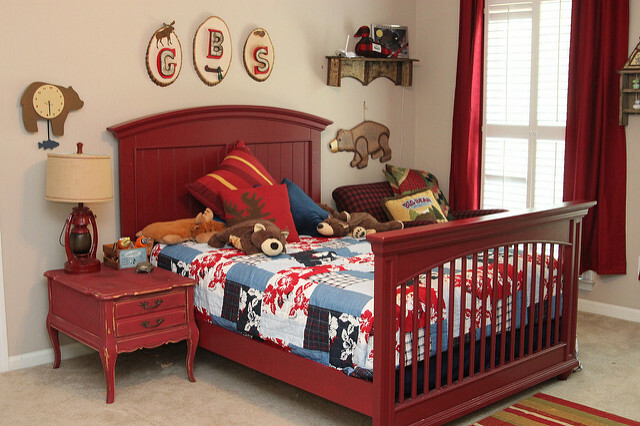 This is the look I’m going for in my little guys room! Where did you find his lantern lamp?